What does it say about me that I am content and happy when I have chocolate in the house, hidden from the kids or not? It’s like Chocolate Valium. Individual Dove chocolates are my “dolls” (for those of you young-uns, see Valley of the Dolls). That I look forward to the day after Valentine’s Day so I can race over to Target to buy Dove hearts at half price? That the day after Christmas at the grocery store I drooled over a 5-POUND Hershey bar that was ½ off (originally $35)? That I wish some company made chocolate pens, chocolate books, chocolate pillows, chocolate-covered French fries? Yes, I know I’m headed for Diabetes-ville. That’s why I’m enjoying my sugar while I can. My grandma had to go off chocolate for many, many years because the doctor said the caffeine made her heart race (“poor woman”, we cluck our tongues, shake our heads and say). Click here to see the caffeine content in chocolate versus tea or coffee or soda. Do you love chocolate? What’s your favorite chocolate thing? P.S. I joined Weight Watchers (for the, ahem, THIRD time) back on the 20th so I’ll let you know how my chocolate addiction goes. Is there a 12-step program for that? 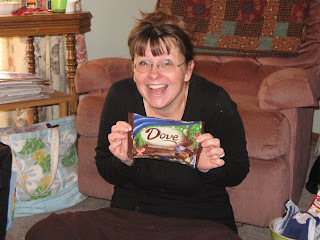 Click here to read a review of the new sugar-free Dove chocolate, which you know I will be trying to find ASAP. And how do you get a gig reviewing chocolate? Count me in! P.S. Dove has chocolate parties now. I just sent an e-mail to try to set one up. They'd better bring on the sugar-free stuff or there will be bloodshed.